Make the chocolate cakes Preheat the oven to 350°. Grease two 10-inch round cake pans, line with parchment and grease the parchment. In the bowl of a stand mixer, whisk the flour, sugar, cocoa powder, baking soda, baking powder and salt. In a large bowl, whisk the buttermilk with the 1 cup of oil, the eggs and vanilla. At low speed, using the paddle, beat the buttermilk mixture into the dry ingredients. Add the hot coffee and beat until just combined. Pour the batter into the prepared pans and bake for 35 to 45 minutes, until a toothpick inserted in the center comes out clean. Transfer the cakes to a rack to cool for 15 minutes, then turn them out onto the rack, peel off the parchment and let cool completely. Wrap in plastic and refrigerate. Make the German chocolate filling In a medium saucepan, cook the evaporated milk, sugar, butter, egg yolks and salt over moderate heat, stirring, until the mixture comes to a boil and thickens, 8 to 10 minutes. Remove from the heat and stir in the coconut, pecans and vanilla. Scrape the filling into a bowl. Refrigerate until cold. Make the cheesecakes Preheat the oven to 350°. Spray two 10-inch round cake pans with cooking spray, line with parchment and spray the parchment. In a food processor, pulse the graham crackers, pretzels and chocolate cereal until fine crumbs form. Add the melted butter and pulse to combine. Press the crumbs evenly over the bottom of one of the cake pans to form a very thin crust. Bake the crust for 5 minutes, until fragrant and browned. Transfer to a rack and let cool completely. Reduce the oven temperature to 300°. In the bowl of a stand mixer fitted with the paddle, beat the cream cheese with the sugar over moderately high heat until light and fluffy, about 2 minutes. Add the eggs, espresso powder and vanilla and beat until combined. Divide the batter into the prepared pans (one with the crust, one without) and spread the batter evenly. Bake for about 15 minutes, until the cheesecake is set. Transfer to a rack to cool for 30 minutes, then wrap the pans in plastic and refrigerate until completely cooled. Make the buttercream In a medium bowl, whisk the confectioners’ sugar, cocoa powder and salt. In a double boiler, whisk the egg whites with the granulated sugar over simmering water until the sugar has dissolved, about 2 minutes. Pour the egg whites into the bowl of a stand mixer fitted with the whisk and beat at high speed until stiff, glossy and cool, about 5 to 7 minutes. At medium speed, whisk in the cocoa mixture until combined, then add the vanilla. Using the paddle attachment, beat in the butter and shortening, adding a few tablespoons of each at a time, until the buttercream is fluffy and firm, about 5 minutes. Assemble the cake Using a serrated knife, trim the domed tops of the chocolate cakes to flatten them; reserve the scraps for another use. Cut each chocolate cake horizontally into 2 even layers. Place a small spoonful of buttercream in the center of a large, flat plate. Invert the crusted cheesecake onto another plate and remove the parchment, then turn it crust side down and center it on top of the buttercream. Spread 1 1/2 cups of the buttercream on top of the cheesecake and top with 1 layer of chocolate cake. Spread half of the German chocolate filling on top of the chocolate cake and top with the second layer of chocolate cake. Spread 1/2 cup of the buttercream over the chocolate cake (a very thin layer) and top with the crustless cheesecake. Remove the parchment from the cheesecake. Spread 1 1/2 cups of the buttercream over the cheesecake and top with the third layer of chocolate cake. Spread the remaining German chocolate filling over the chocolate cake and cover with the remaining fourth layer of cake. Spread the remaining buttercream all over the cake using an offset spatula, to ensure that the top and side are smooth and even. Freeze the cake for 20 minutes. Make the ganache In a small saucepan, bring the cream, corn syrup and butter to a boil. Remove the saucepan from the heat. Add the chocolate and whisk until it’s melted and the mixture is smooth. The ganache should be warm to the touch but not hot. If the ganache is too cold, microwave in 20 seconds increments. Set a cooling rack over a rimmed baking sheet. Very carefully transfer the cake from the plate to the rack. 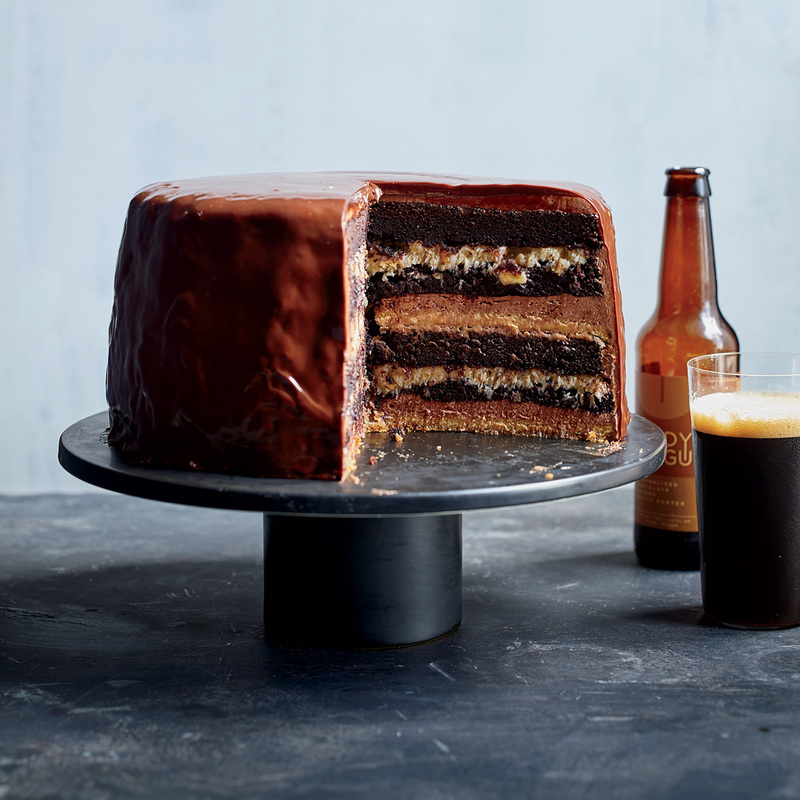 Starting at the center and working outward in circles, slowly pour the ganache over the cake until you reach the edge, letting the ganache drip over the side to enrobe the cake. Let set for a few minutes, then very carefully transfer the cake to a platter. Refrigerate until ready to serve, at least 30 minutes. If cold, let the cake come to room temperature before serving. The chocolate cakes, cheesecakes and German chocolate filling can be refrigerated for up to 2 days. The finished cake can be refrigerated for up to 1 week. Review Body: The richest best chocolate cake. It is amazing. Review Body: This takes every bit of the estimated time to make and gets every pan, measuring spoon, cup, mixer, paddle, whisk, bowl and Tupperware I had. And worthy every bit of work. Do start the day before. And yes there is a typo where it tells you to beat over heat in the mixer. Obviously don't, it's moderate speed. The cake fills the mixing bowl of my KA mixer to the MAX and I might add the liquids by hand next time. Or maybe it's time to step up the mixer to the bigger one. At any rate, I made this for the neighborhood Christmas party and it was more than a hit. I was joking only a bit that this might be the only time where a slice of pecan pie would be a better choice for your waistline, but worth every bit. I can see using the cake and German filling alone without the rest and still getting great reviews from family and friends. It's a great recipe! Review Body: Please answer KontrarianKook’s question about the heat and stand mixer. It has me stumped also. Review Body: In Step 5, the recipe says: "In the bowl of a stand mixer fitted with the paddle, beat the cream cheese with the sugar over moderately high heat until light and fluffy". How do I put my stand mixer over moderately high heat?